Gonorrhoea could become an untreatable disease, England's chief medical officer has warned. Dame Sally Davies has written to all GPs and pharmacies to ensure they are prescribing the correct drugs after the rise of "super-gonorrhoea" in Leeds. Her warning comes after concerns were raised that some patients were not getting both of the antibiotics needed to clear the infection. Sexual health doctors said gonorrhoea was "rapidly" developing resistance. 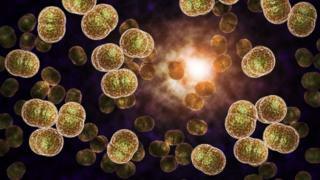 A highly drug-resistant strain of gonorrhoea was detected in the north of England in March. That strain is able to shrug off the antibiotic azithromycin, which is normally used alongside another drug, ceftriaxone. In her letter, the chief medical officer said: "Gonorrhoea is at risk of becoming an untreatable disease due to the continuing emergence of antimicrobial resistance." But while an injection of ceftriaxone and an azithromycin pill are supposed to be used in combination, this may not always be the case for all patients. Earlier this year, the British Association for Sexual Health and HIV (BASHH) warned that some online pharmacies were offering only oral medication. Using just one of the two drugs makes it easier for the bacterium to develop resistance. The letter, which is also signed by chief pharmaceutical officer Dr Keith Ridge, stated: "Gonorrhoea has rapidly acquired resistance to new antibiotics, leaving few alternatives to the current recommendations. "It is therefore extremely important that suboptimal treatment does not occur." Symptoms can include a thick green or yellow discharge from sexual organs, pain when urinating and bleeding between periods. Often the person has no symptoms, however, but can still easily spread the disease to others. Gonorrhoea is the second most common sexually transmitted infection in England and cases are soaring. The number of infections increased by 19% from 29,419 in 2013 to 34,958 the following year. Dr Jan Clarke, the president of BASHH, told the BBC News website: "We're really pleased that the chief medical officer has stressed that gonorrhoea needs this approach to treatment due to the rapid development of resistance. "We need to protect what we've got and we need to encourage pharmacists and general practitioners to follow first-line treatment." Dr Andrew Lee, from Public Health England, added: "Investigations are ongoing into a number of cases of anti-microbial resistant gonorrhoea. "Public Health England will continue to monitor, and act on, the spread of antimicrobial resistance and potential gonorrhoea treatment failures, to make sure they are identified and managed promptly."